Коварством и хитростью мы заманили из Берлина в Проджектор Алису Травкину — прекрасную девушку, которая в раннем детстве переехала в Германию, получила там серьезное дизайн-образование и теперь создает интересные цифровые проекты с применением процессинга, ардуино и тд. На дизайн-пицце Алиса расскажет о немецком подходе к дизайну, о тенденциях мультидисциплинарности, о совмещении арт-проектов с коммерческими, о важности программирования в дизайне и о многом другом. Приходите со своими вопросами, гостья более чем интересна. 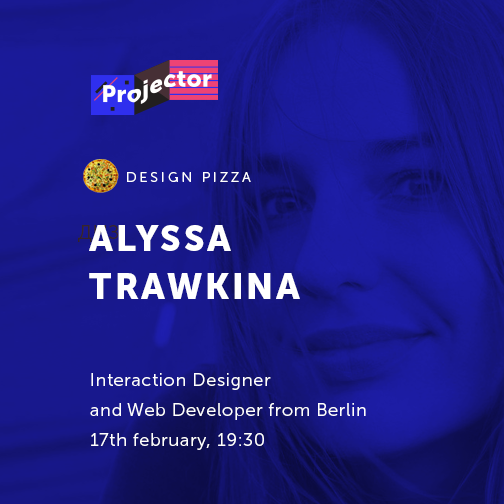 Alyssa Trawkina is an Interaction Designer and Web Developer from Berlin working on web applications and concepts, interactive media installations and speculative and critical design approaches. She likes to explore the boundaries between design, art, technology and other disciplines and find new ways of interacting with technologies. Alyssa gathered her study and work experiences at various institutions like BTK (Berlin University of Art & Design), FHP (Potsdam University of Applied Sciences), UDK (Berlin University of the Arts), MIT (Massachusetts Institute of Technology) and ART+COM (Design Studio for media installations and spaces). The lecture will provide an overview on the subject of experimental new media and design practices, digital design and art. What else does the creative design sector offer besides the department of applied Screen, UX Design and classical Graphic Design? The lecture will contain a presentation of inspiring projects and approaches exploring and designing interactions between society, people, science and technology.